Get near-tissue equivalent thermoluminescence dosimetry (TLD) performance with a high-capacity reader for all types of TLD elements and health physics applications. The Thermo Scientific™ HARSHAW TLD Model 5500 Automatic Reader provides unattended operation for up to 50 dosimeters and accommodates TL chips, disks, rods and cubes in a broad variety of sizes. This reader is suitable for all kinds of applications that require TLD detectors. Clinical applications are: Radiotherapy planning verification, total body irradiation dose verification, critical organ dose verification, diagnostic dose studies including CT, and many others where measurement quality assurance is critical. 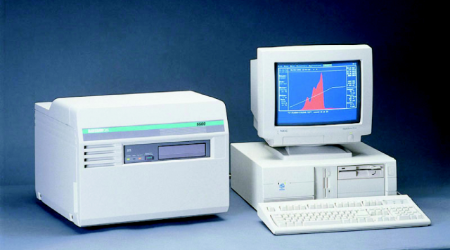 The HARSHAW TLD Model 5500 Manual Reader includes a carrier disk for up to 50 TL detectors, a linear, programmable contactless nitrogen heating system, and a cooled photomultiplier tube with associated electronics to measure the TL light output. The operational software, Thermo Scientific™ WinREMS™, which runs on a separate computer, provides the user interface, the reader control and the applications software. Multiple, programmable, linear heating cycles including pre-read anneal, acquire and post-read anneal cycles. Heating temperature capability up to 400°C. Options include glow curve deconvolution software (WinGCF Software), various types of neutral density filter to extend the high measurement range, and TL element specific carrier disks for best possible reproducibility. Size: 38 × 46 × 48cm. Radiation types: photons (E>5keV), electrons (E>70keV), neutrons (from thermal energies up to ∽100MeV, TLD-600 only). Repeatability: Less than 2% variation based on one standard deviation for 10 sequential measurements of 1 mGy 137-Cs. Residual TL signal: <0.2% of reading. Flow Rate: internally regulated to 400 liters/h if specified pressure is provided. Operating temperature: 15° to 40°C. Storage temperature: -10° to +60°C. Humidity: Functions within specification after 24 hour exposure to 90% humidity and subsequent 6-hour recovery with use of the nitrogen supply. Ambient light exposure: Functions within specifications when exposed to ambient light up to 1,000 Lux with cover on the reader. Shock: Withstands a 1-cm drop onto a concrete surface. Treatment planning verification, diagnostic dose studies, quality assurance, whole body dosimetry, extremity dosimetry, environmental dosimetry, high dose applications (radiation hardness testing), and many more.